chocolate chips | What's Cooking at the Genua's? When we think of pizza we don’t usually think of a dessert. But this is just that. 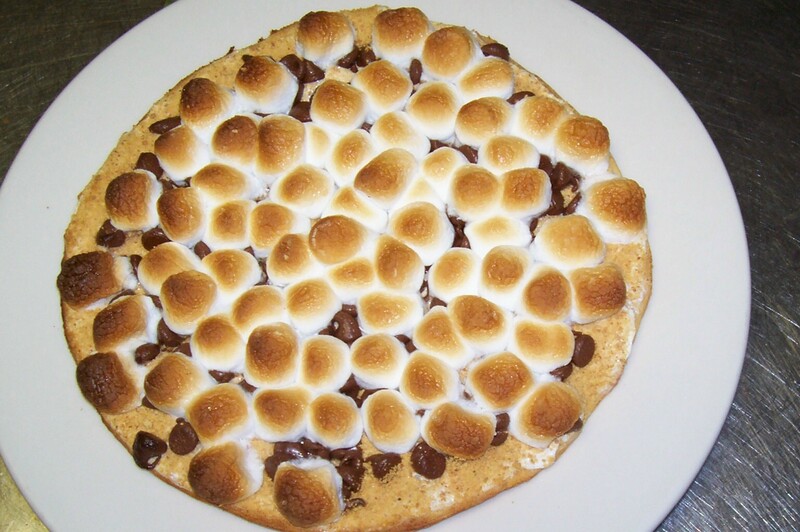 Most people love s’mores and now it’s a dessert pizza. Kids and grown-up kids will love it! So easy to make and fun to eat! I am actually one of those kids who like their s’mores separated. I liked all the ingredients but not together. Go figure. Then again I was always happiest with a divided dinner plate. But that’s another story for another day! So play around with this, change it up if you like. Change the chips to flavored chips, like butterscotch or caramel. Be creative! 1. Preheat the oven to 375ºF. Spray a 9″ springform pan with nonstick spray. 2. Place the graham crackers, yogurt spread and sugar into a food processor and pulse until fine crumbs form. Press the crumbs into the bottom of the pan. Bake until just set, about 10 minutes. Remove the pan from the oven and reduce the oven temperature to 350ºF. 3. Sprinkle the marshmallows and the chocolate chips onto the crust. Bake until the marshmallows are lightly browned, about 15 minutes. Let cool for 15 minutes and then drizzle the top with the chocolate syrup. Per serving: 193 calories, 5 grams fat, 38 grams carbs, 1 gram fiber, 2 grams protein, 10 mg calcium. I think just about everyone out there has had Rice Krispie treats at one point in their life. Well today’s recipe is done completely in the microwave oven! No pots involved! The only pan used is the one we’re going to be cooking in! How cool is that! I am also going to give a few variations on the traditional kind. So get your microwave all cleaned up and let’s go! Oh and don’t forget to throw some flour on you and on your face to make it look like you slaved all day on these! 1. Melt the butter in an 8 x 8 inch glass/ceramic dish on HIGH power for 45-60 seconds. Stir in marshmallows and salt. 2. Microwave 1½-2 minutes on HIGH power until soft and melted, stirring after 1 minute. Stir every 30 seconds until completely smooth. 3. Add the cereal, 1/3 at a time, stirring with a fork until well coated. Press into dish with the fork. Cool, then cut into 1¼ inch squares. 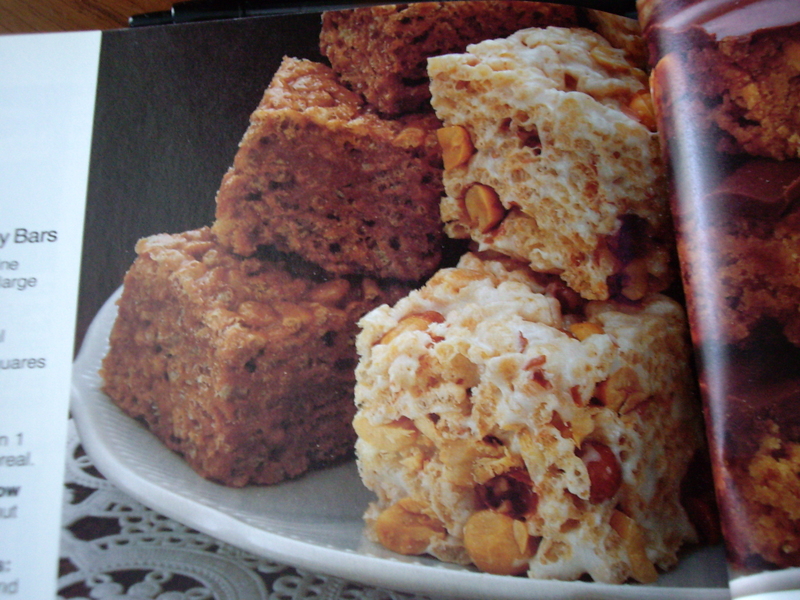 Marshmallow-Peanut Bars: Completely stir in 1 cup salted peanuts after the cereal. Peanut Butter-Marshamallow Bars: Add ¼ cup peanut butter with the marshmallows. Chocolate-Peanut Bars: Add ¼ cup peanut butter and ½ cup chocolate chips with the marshmallows. As promised here is the recipe for the actual Friendship Bread or Amish Friendship Bread as it’s called sometimes. Amish Friendship Bread has been around a long time, and some people claim that the recipe did indeed come from the Amish. However, there is no real connection to the Amish people. No matter where the original recipe came from, the fun is in the sharing. 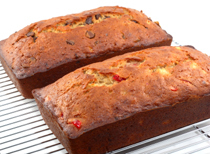 You create a bread mixture and after it is ready to bake you share some of the dough with your friends or family. You give your friends parts of the dough, and you keep some of it so that you can continue to make it. You can keep the chain going on your own, and your friends can start chains of it as well. No matter what, the Amish Friendship Bread is something that you can all share. If you get a starter from a friend, you can easily follow the instructions that come with it. There are also so many things you can do with the mixture once you are ready to bake it! I will give some examples of what you can add to your bread at the end. It’s up to you, be creative! Have fun!! 1. In a large bowl combine starter, oil, eggs and vanilla. Stir well. 2. In a separate bowl, combine flour, sugar, cinnamon, salt, baking powder and baking soda. 3. Stir dry ingredients into wet mixture until just combined. Stir in chocolate chips and nuts. 4. Spoon mixture into 2 well greased loaf pans and bake in a 350º oven for 45-55 minutes or until toothpick comes out clean.